On the plane to Vancouver recently, I watched about half of a movie called Book Club. It starred Jane Fonda, Mary Steenburgen, Candice Bergen and Diane Keaton. They played a group of rich, attractive, over-60 American women, friends for many years, who lived in gorgeous homes and dressed very nicely (especially Ms Fonda), and liked to drink wine in long-stemmed glasses while they talked about books. The latest book? 50 Shades of Grey. If you’d like to see a film about mature sexuality and love, this isn’t it. The quartet of excellent actors were badly let down by the script. I know it was meant to be a comedy, but couldn’t the writers come up with anything better? The “she spiked her husband’s drink with Viagra” routine was just awful. In fact, I thought the whole film was terrible – stupid and insulting – but perhaps I don’t have a sense of humour. The best thing about it is 80- year old Jane Fonda’s simply amazing state of preservation. I am also member of a book club. It’s a Council of Adult Education group. We get to browse a book list and mark our suggestions, then nine times a year a crate of books is delivered to our coordinator. We pick them up, read them and, on rotation, host a meeting in our homes, with cheese and crackers, wine, a cake. The other members are all women, all over 50, all busy being interesting and skilled and clever people, working as nurses, teachers, administrators, social workers, garden designers. Professionals, in other words. And as partners or wives, mothers, carers, homemakers. We’re not besties, though I’ve known some of the women for more than 20 years, but we do talk together – or it seems to me, anyway – quite openly about our lives, our struggles, our failures and our successes. We certainly don’t look like Jane, Mary, Candice and Diane, but that’s because it’s not a movie and we are real. As someone from the world of books and literature, a writer and bookseller, I look like an asset to the group – on paper at least – but I don’t think I am. The other women are shrewd and intelligent readers. They’re able to analyse the books in ways that don’t occur to me. Their comments and opinions are thoughtful. I often come away thinking that I’m a lazy reader, for I seem to read acceptingly, just allowing the novels (we seem to only read fiction) to wash over me. Or perhaps I’m just plain lazy. Too often this year, I haven’t finished the set book. In a couple of cases, I barely even started. Nine books! It shouldn’t be that hard. So I am pleased to report that for the first time this year, I have finished my book group novel ahead of time. 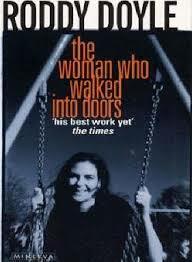 We’ve had a series of books I’ve found depressing, and this one – The Woman Who Walked Into Doors by Roddy Doyle – looked like more of the same. But – lucky last! – I couldn’t put it down. I am still thinking about it. It’s the voice. It’s so often the voice. The book starts with the doorbell. A young Guard, come to tell Paula bad news. What’s more, the gender assumptions in her world are brutal. The scenes of violent abuse are chilling. “I went to the doctor: whack. He followed me. There’s nothing wrong with you; what’s your problem? Whack. And I loved him when he didn’t do it. I loved him with all my heart. He was so kind. He just lost his temper sometimes. He loved me. He bought me things. He bought me clothes. Why didn’t I wear them? Whack. She hides her injuries, she blames herself – and yet, somewhere inside, she wonders why the doctors and nurses she sees so often in Casualty don’t ask the right questions, the ones that will free her to tell what’s really happened, so that she and her children will be rescued and never have to face Charlo again. If this sounds grim, it is, but Doyle is so skillful a writer. His Paula is vulnerable and flawed, and yet a survivor. And what’s more, a brave and loving woman, and not at all stupid.